The nearest most holidaymakers get to a crocodile is watching a glove puppet at a seaside Punch and Judy show. So just imagine going for a dip with the express aim of putting yourself within biting distance of half a ton of real-life hungry man-eater - and paying for the privilege. 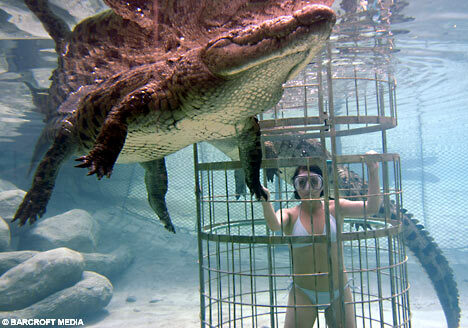 Welcome to the world of "Croc Cage Diving", the latest must-do experience for adrenaline junkies. Something of a snip, but hopefully not a snap, at £20 (300 Rand) for ten minutes, thrill seekers visiting Cango Wildlife Ranch, an endangered species breeding centre in Oudtshoom, South Africa, are informed by the organisers they will 'get close enough to see the crocodiles' toenails'. And that, of course, means the fearsome teeth belonging to one of the world's fiercest predators are not going to be far away either. The ranch claims to be the only place in the world to offer such close encounters. 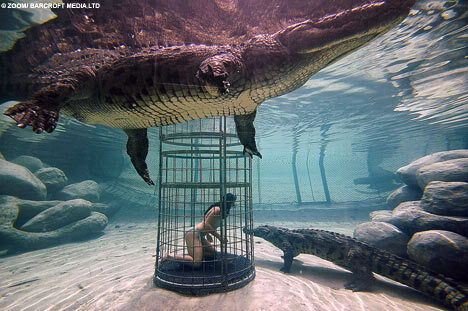 Daredevils are lowered in a reinforced steel cage by a crane into a crystal clear, purpose-built heated pool inhabited by Zimbakwe, a 14ft long Nile Crocodile, and his slightly smaller female companions Ma Baker and the somewhat disarmingly named Sweet Sue. Participants wear their own swimming trunks or bikinis and use snorkelling gear instead of scuba equipment so anyone can have a go, although there is a minimum age of 12 and children under 16 must be accompanied by an adult during the dive. Some of the cage sticks out above the surface of the 6ft deep water so divers can get a better view of the thrashing tails if they don't fancy spending all their time underwater. Among those who have taken the plunge is Kerry Shaw, 28, a South African media executive. "I was a little nervous but very excited to get into the water," she said. "It was a once-in-a-lifetime opportunity and a chance I didn't want to miss out on. "I did check quite carefully that the cage door was closed and properly secured. "The instructions weren't as simple as "don't put any part of your body out of the cage." "There are two bars at different heights around the inside of the cage to hold onto so you don't touch the outside of the cage. "I didn't use any underwater breathing equipment. "So I just had to hold my breath for as long as I could to be under water long enough to enjoy the crocodiles." Zimbakwe, who is 80 years old and weighs 1240lbs, was the first to swim over to investigate, followed by his mates. "When they got to the cage they sank to the bottom and pushed the cage a bit and swam round and round me," said Miss Shaw. "Zimbakwe was my favourite. I could hold his paw or his tail while he was next to the cage - it felt like a human hand in a leather glove. 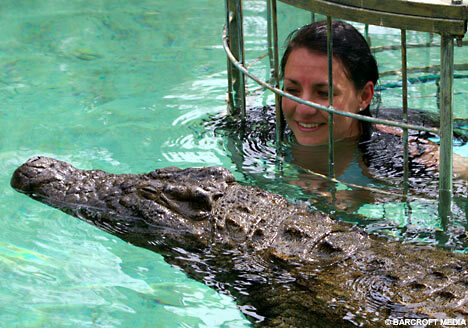 "There is a viewing opening just above half way up the cage that is big enough for the crocs to put their noses in. They can't open their jaws because the viewing opening isn't wide enough but when their noses are that close that is pretty scary." Such antics will no doubt dismay animal rights campaigners, but the organisers insist no harm is done to the crocodiles. The ranch's website says: "Crocodiles are fascinating, powerful creatures and the only time when you can truly appreciate the sheer power of these animals is when they are underwater. "On land these ancient reptiles look sluggish but by entering their environment you can truly see why these animals are such excellent hunters. 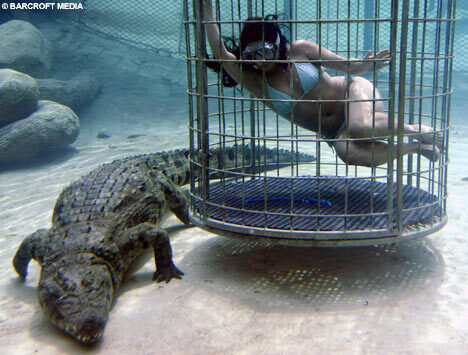 "The crocodiles used for Croc Cage Diving are all captive bred animals that are used to human activity. "Since we do not chum - when bits meat or fish are dropped in the water to tempt them closer - our crocodiles to encourage them to move towards the cage, the impacts on the crocodiles are minimal. "The cage with the diver is simply manoeuvred as close as possible to the crocodiles to give you a close up encounter with these super predators."